The drake (male) smew is striking and unmistakable with a mostly white body marked with a black eye patch, breast bar and v-shaped nape patch beneath the crest. The eyes are black and the wings are dark with large white patches. The hen (female) is smaller than the male and has a chestnut head, white throat, and dark brown eyes. The breast is light grey and the rest of the body is dark grey. Juveniles resemble the hen, but the central wing coverts (coverings) have brown edges. 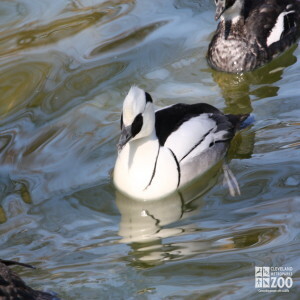 The smew’s black bill has a serrated edge with a hook at the tip. Its legs and webbed feet are grey. As with all ducks, the females molt when the chicks are half grown; the males slightly earlier. The ability to fly is reached by the young and regained by the adults in late summer when the family is then ready to begin the fall migration. The smew is a migratory bird with a large global range. During breeding season it stays in the taiga of northern Europe and Asia (evergreen forests of the subarctic region). It winters on sheltered coasts and inland lakes from Central and Southern Europe, Northern Africa, and Southern Russia to China, Japan and as far east as the Western Aleutian Islands. Smews inhabit fish-rich freshwater lakes, ponds and rivers along coniferous forests. Gestation lasts about 26 to 28 days. Groups of smews travel in an oblique line and a V-formation. They fly swiftly and noiselessly and are quite maneuverable in confined spaces. A surface diving bird, the hook-tipped and serrated edges of its bill are used to capture and hold onto its prey. It also swims underwater in pursuit of its prey. Though usually silent, its sound is a harsh “krrr” note. Males make occasional low croaks and weak, hissing whistles, as well as unusual soft, prolonged, mechanical rattling calls like a wristwatch being wound. Females hum and produce grating, rattling, growling notes. It is a shy bird, and flushes easily when disturbed with the ability to spring suddenly from the water. Smews reach sexual maturity during their second year. They are monogamous (mate with only one bird during a season) and nest in single pairs or loose groups. Breeding begins in April and May. Courtship involves a variety of male displays including upward stretches of the head with an erect crest, wing-flapping, crest-raising, display drinking and preening movements. They nest in tree hollows, including abandoned woodpecker holes, and in artificial nest boxes. The nests are lined with feathers and down. The female incubates 6-9 cream colored eggs. The chicks are covered with a sooty black down with white underneath and are precocial (capable of a high degree of independent activity from birth).